I don't think I've ever taken a photo with such a white background haha, it kind of looks like a stock image but I assure you I took it. Anyway... back to what I'm actually meant to be talking about..... a new face mask! I mentioned this 7th Heaven mask a few weeks ago and I said I'd let you know how it was after I had tired it on. 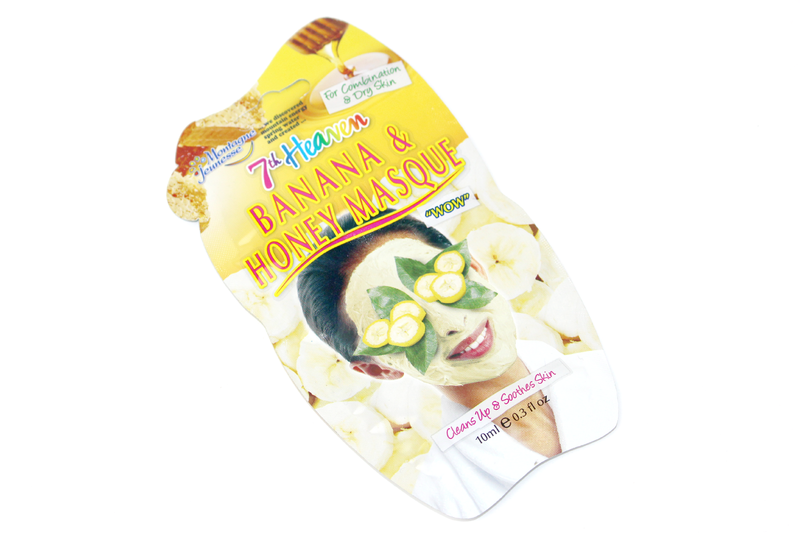 This is the Banana & Honey Masque, aimed to clean and soothe your skin in just 15 minutes. At only £1 I feel like these masks are always worth a go and even if you find you don't really like it then just pick up another and try again. Usually I'm pretty lucky and get on with most of them, this being no exception. I've learnt that I'm not one for peel off masks so I tend to steer clear of those and go for the wash off versions instead. The mask itself was a clearish gloopy consistency...which obviously smelt like bananas. In fact it was like rubbing really, really smooth mashed banana over my face. I added a generous layer evenly all over my face and left it to dry, while I got on with a few household chores. Once the time was up I washed it it off with warm water and patted my face dry. Now I'll be honest my skin didn't feel different, sometimes with masks I feel like my skin has had an overhaul with it feeling softer and smoother, this didn't do that. BUT I have to say I could seriously see a difference, my skin was was bright and had a lovely healthy glow about it. So if you're having a good skin day and fancy just giving yourself a bit of a radiance boost, this is definitely a cheap treatment to try out. Ohhh this sounds interesting. Too bad I hate bananas, so smelling like one would be a big no no. Maybe they do different ones. Love the sound of this, Does it smell of honey at all ? I hate that smell! Ooo this one sounds lovely! I picked up some of their new face masks the other day!